In the face of a calamity, does life come to a standstill? Moving image: I usually wander off for long walks in the city. 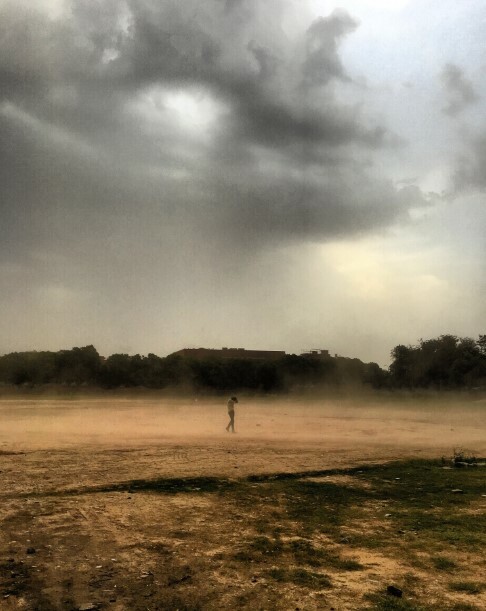 It was during this time that I realised a sandstorm was approaching. In search of interesting imagery, I reached this vast expanse of land and saw almost 20 people playing cricket. They continued irrespective of the storm. Whenever a strong wind would pass, the players would just cover their heads, wait for it to subside and then resume their game. I found this very inspiring as the players didn’t lose hope. I think that is what a person’s attitude towards life should be. Photographer: Samar Singh Virdi is a filmmaker and photographer from Chandigarh. His film Ilam-Punjab’s Unknown Battle of Sanity won two student national awards, and his clientele includes the Hero group, University of Liverpool and L’Oréal Paris.